Gluten, found in rye, barley, wheat and certain cross-breeds of these grains, is a type of protein that the average healthy person can digest without a hitch. But if you're sensitive to gluten or have celiac disease, it's something you'll have to avoid. Brown rice is naturally gluten-free, but in some cases, gluten can come into contact with brown rice. Gluten-free brown rice becomes cross-contaminated with gluten when something in the kitchen that touched gluten then touches the rice. For example, if you make a batch of dough in a bowl using wheat flour, wipe it out and then use that same bowl to mix up brown rice and chopped veggies, leftover gluten molecules on the bowl can leach into the brown rice. Or if you have a spoon you used to scoop croutons, you can contaminate brown rice with gluten if you use the same spoon to stir it. Cross-contamination like this can happen in commercial kitchens when you go out to eat, too. This is why it's imperative to let your server know your food has to be gluten-free. Be wary of brown rice storage when you're buying it at the grocer's. Avoid buying brown rice in bulk bins since you have no way of knowing how the rice has been handled. Also skip purchasing packages that are clearly shelved below flour, baked goods, bread or dry grains. Gluten can sneak onto brown rice packaging or even into the brown rice in these cases. Lastly, buy only plain brown rice. Seasoned varieties of brown rice or types that are packaged with dried vegetables could contain gluten. At home, keep a gluten-free section in your pantry. 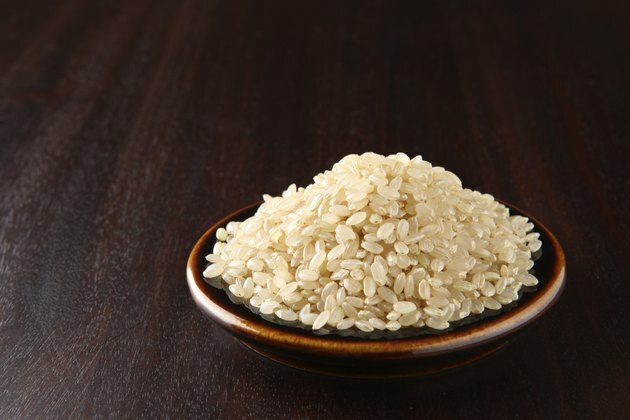 Don't store brown rice below anything with gluten -- dry grains, bread, flour or processed foods. The same rule applies in your refrigerator. Gluten particles can drop down into the brown rice or fall onto the brown rice container such that when you cook the rice, any surface or utensil that comes into contact with that container could wind up with gluten on it. Eventually that gluten can make its way back into prepared brown rice. On the label, food manufacturers have to declare if their food has been prepared in a plant that processed wheat. You'll see a phrase like "manufactured in a facility that processes wheat." As determined by the U.S. Food and Drug Administration, to be truly gluten-free, a product can't have more than 20 parts per million of gluten -- a minuscule amount. While you already know brown rice shouldn't have any gluten, read the package anyway and watch for "gluten-free" or "free of gluten." Phrases such as these ensure that the food you're getting is gluten-free and safe for you to eat.